Unwanted hair is a universal problem with women and having a silky, hair free skin is every woman’s dream.Laser hair removal is this dream come true and a wonderful alternative for the traditional methods of hair removal like waxing, bleaching and shaving. Additionally, it is the ideal choice of hair reduction for clinical conditions like folliculitis, ingrown hair,acne keloidalis nucha, etc..Also in clients with dark underarms, in addition to avoidance of fragrance and friction, laser becomes the ideal approach for hair removal. While a lot of lasers are available in the market, Long Pulse Nd Yag Laser and Diode laser are most suited for Permanent Laser hair removal in Indian and ethnic skin type. Laser hair removal works on the principle of selective thermolysis of melanin pigment of hair follicles. By virtue of this property, with every session a small part of hair root is destroyed. The aim is to achieve a 90% destruction of hair root to have best results. Permanent Laser hair removal best works on thick hair - so underam hair, bikini hair, below knee and below forearm are best regions for good results. There are some medical conditions like PCOS, where thick hair develops on chin, jawline, sidelocks, neck and below navel. These conditions require simulatneous medical treatment in addition to laser hair reduction. While until a few years ago, Permanent Laser hair removal as a procedure was dominated by women, nowadays more and more men are going for the same. Underarm hair,hair on ear pinna, forearm hair, cheek hair, chest hair, shoulder hair and leg hair are the common areas that men seek to get their hair lasered. 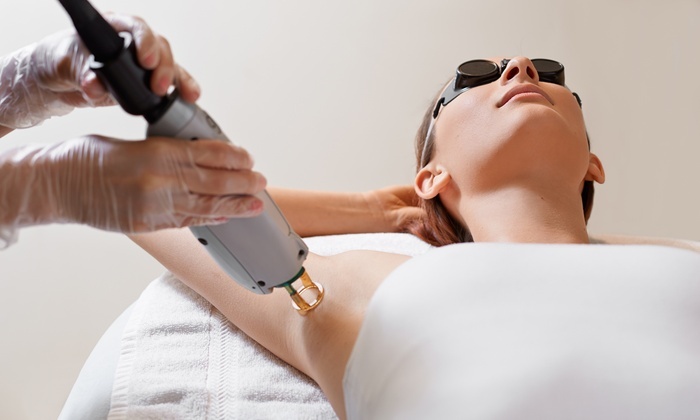 Laser hair removal, happens in 6 to 10 sessions, at intervals of 1 to 1.5 months. In clients with underlying hormonal conditions, the sessions may be doubled. So during the initial consultation for laser, the client is advised to undergo some blood tests (If hormonal cause is suspected) and accordingly the procedure is begun. The area to be lasered is cleansed, marked and shaved. The patient is given protective eyewear and a chilled gel is applied on the area. The laser shots are delivered which are almost painless due to the ultracool laser tip. Sunscreen is applied and the client is good to go with a list of post procedure instructions.. A week later, the client will experience new hair growth which on shaving will reappear after 3 to 4 weeks. This is the time for the next laser session ( 4 to 6 weeks later). Permanent Laser hair removal is a simple, affordable and safe manner of getting rid of unwanted hair for men and women when done with the right doctor and the right laser.